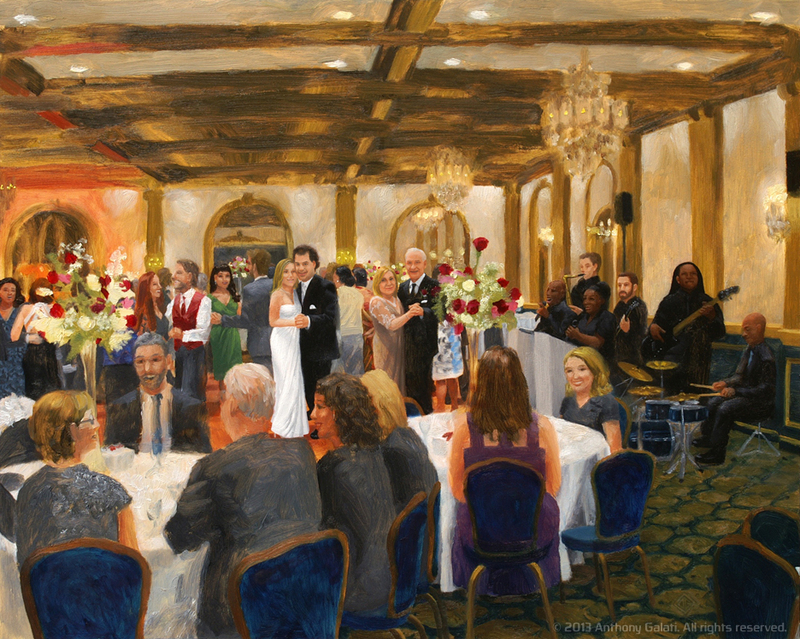 The Kazz Music Orchestra was featured in a painting done by artist Anthony Galati during a wedding that we played at in November 2012 at The Madison Hotel in Morristown, NJ. I know this is something that has started to become more popular at weddings, but we’ve never been at a wedding where this has taken place, and seeing the final product, I’m more than impressed by Anthony’s work! This painting was a gift to the bride and groom (Ray and Jennifer) by one of the guests, and we had been watching Anthony work on it throughout the night, but I had no clue how cool the final paintingwas going to turn out! If you’re considering something very unique as a way to remember your wedding, I’d definitely get in touch with Anthony. He was a really great guy to talk to, and as you can see, he does really amazing work!